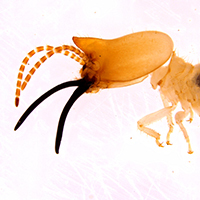 This soldier termite and related species are called nasutes. 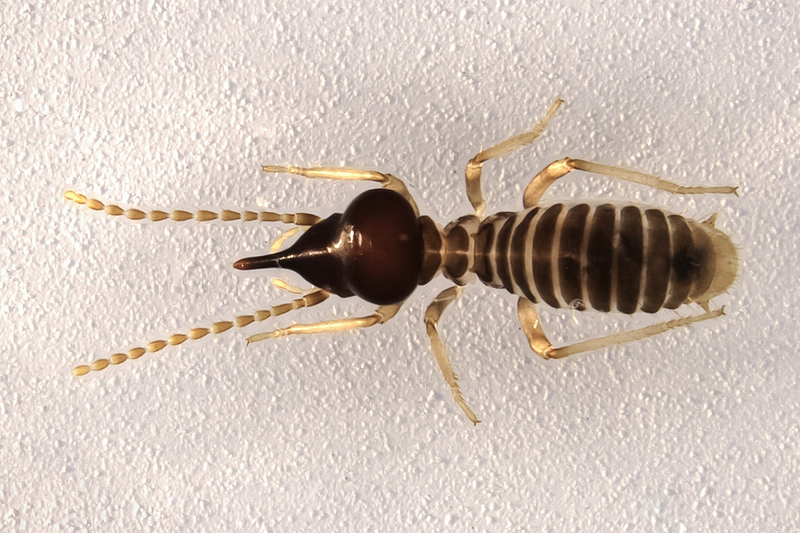 Their mouthparts are fused to form a projection that squirts defensive chemicals to repel marauders attacking the colony, in contrast to other types of termites that have long, swordlike mandibles. Termites are the theme of the annual Insect Fear Film Festival on Feb. 23. 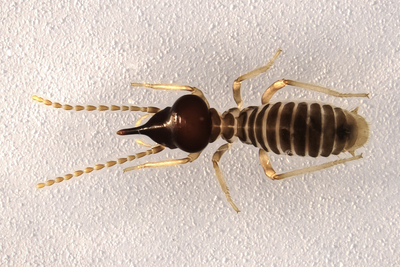 CHAMPAIGN, Ill. — Termites are vilified as destroyers of all things wooden, but they are also misunderstood. 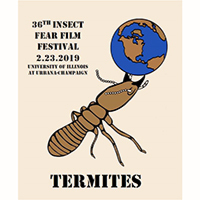 Termites will take center stage at the 36th Insect Fear Film Festival on Feb. 23 at the University of Illinois. The festival’s feature film is “Alien Apocalypse” (2005, rated TV-14), about alien termites that have enslaved humans to harvest the wood on Earth because they’ve exhausted the wood supply on their home planet. The three family-friendly short films have basically the same plot. In “Termites from Mars,” “Insect to Injury” and “Pink Pest Control,” termites invade and eat a tree home, a picket fence and a log cabin until Woody Woodpecker, Popeye and the Pink Panther, respectively, figure out a way to stop them. “It’s not a fair representation of termites,” said Berenbaum, the founder of the film festival. 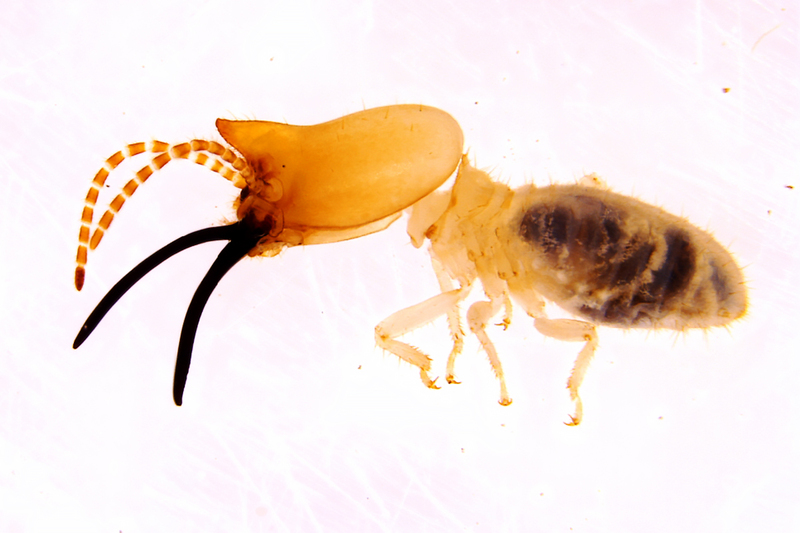 The head and mandibles of this termite from South America are larger than the rest of its body. It uses the very long mandibles to defend the colony. Termites are within the same biological order as cockroaches but exhibit some of the social characteristics of bees and ants. Termites can’t break down the cellulose in the wood they eat, so they depend on intestinal microbes to do so for them. Termites eat each other’s feces to share the microbes they need. Many interesting termite behaviors are adaptations for defensive purposes. Snap-jaw termites have snapping jaws with some of the fastest muscle movements across the animal kingdom, and they use their forceful jaws to defend themselves against ants, Berenbaum said. Their colonies are like little insect cities with as many as a million individuals, and termite mounds in Africa can be more than 30 feet high, she said. Visitors to the Insect Fear Film Festival may be able to judge that for themselves. Berenbaum hopes to serve edible termites – dried and salted, with the wings removed, and listed under gourmet snack gifts on an online shopping service. The festival’s Insect Petting Zoo will include termites, as well as a demonstration of their chemical communication system. The ink in a popular brand of pens mimics the pheromones in some species of termites used to signal a trail. “If you write with the pen, termites will follow along. You can see your signature rendered in termites,” Berenbaum said. Nathan Schiff, a research entomologist for the U.S. Forest Service and an Illinois alumnus, will be at the festival with a portion of his insect collection. Schiff – who received a Ph.D. in entomology at Illinois in 1988 – was a student when the festival was founded, and he’s returned to it every year. He works in a hardwoods lab, studying insects that harm trees. He specializes in wasps, but for the last several years he’s been working on a project to revise and update the taxonomy of termites in North America. He’s found several new species. Schiff said there are 50 species of termites identified in North America, and he hopes the project will double that number. Schiff has been collecting insects since he took his first entomology course in college in the late 1970s. He has about 350 drawers of pinned insects and about 1,000 vials of insects preserved in alcohol, collected from diverse ecosystems all over the world. He’ll bring some vials with large termites to the festival, but most of the drawers he brings each year feature large insects that are appealing to kids. “I have beetles as big as a kid’s fist,” he said. The festival also will feature ventriloquist Hannah Leskosky – Berenbaum’s daughter – with her termite puppet, a display of insect-themed artwork created by area students for the festival’s art contest, insect-themed balloon twisting and face painting. The festival is free and open to the public. The doors open at 6 p.m. Feb. 23 at Foellinger Auditorium, 709 S. Mathews Ave., Urbana. Prizes for the art contest will be announced at 7 p.m. and the film screenings will begin at 7:15 p.m.
Editor’s notes: To contact May Berenbaum, email maybe@illinois.edu. 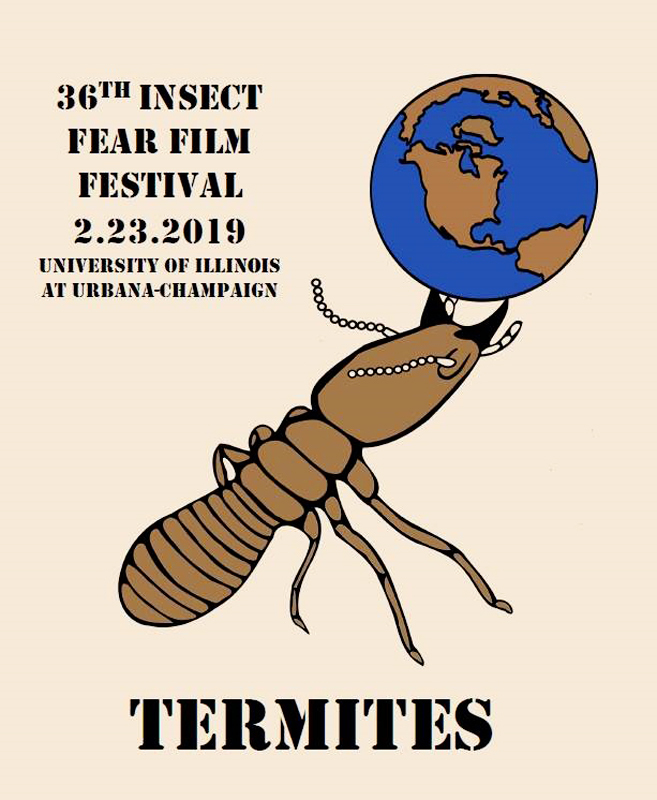 More information about the Insect Fear Film Festival can be found online at https://publish.illinois.edu/uiuc-egsa/ifff/.